A GPS 3 satellite is being tested at a Lockheed Martin facility. WASHINGTON — The Pentagon plans to spend $2 billion over the next five years on a new constellation of Global Positioning System satellites that will be hardened to withstand electronic interference from hostile nations. In a solicitation for bids posted Feb. 13, the Air Force Space and Missile Systems Center announced it will "conduct a full and open competition" for the production of 22 GPS 3 satellites starting in fiscal year 2019. "The GPS 3 that we are moving toward is more jam-resistant, and it is intended to be able to operate in a contested environment," Wilson said. A production contract to build GPS satellites is considered one of the most lucrative opportunities today in the military space world. A 22-vehicle deal could be worth as much as $10 billion. Lockheed Martin will likely be challenged by competitors like Boeing and Northrop Grumman. Proposals are due April 16. The Pentagon's new budget request includes $451.9 million in research, development, testing and evaluation funding in fiscal year 2019, and projects spending about $2 billion on GPS 3 through the next five years. The $451.9 million would cover design and engineering work and pay for the first two space vehicles. The remaining satellites will use procurement funding. The first vehicle of the new GPS 3 would be delivered in 2026. This is considered a "new start" program, rather than a continuation of the existing GPS 3 line. In the 2019 budget, the Air Force slashed funding for GPS 3 procurement by more than $700 million and shifted most of that money to the RDT&E account to start a new program. The GPS constellation is one of the Air Force's proudest achievements. Wilson noted that 40 airmen in Colorado Springs, Colorado, provide GPS positioning, navigation and timing for a billion users worldwide. There are now 31 GPS 2 satellites on orbit that will be in operation until at least 2021. 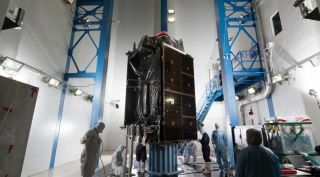 The Air Force is about to start launching the 10 GPS 3 satellites that Lockheed Martin is producing to replace aging GPS 2 vehicles. The first GPS 3 was declared "available for launch" in September and is expected to go into orbit in March 2018 aboard a SpaceX Falcon 9 rocket. Wilson said the Air Force is motivated to move ahead with this new constellation amid growing concerns that nations like China are developing electronic weapons to jam or interfere with GPS signals. "Our pacing threat is China," she said, "because of the pace of their modernization." She mentioned that China in 2007 demonstrated it could shoot down a weather satellite and it is "public knowledge that they can jam satellites," Wilson said. "All those things are an obvious awareness of American dominance in space. I cannot think of a military mission that doesn't depend on space. Our potential adversaries know it, and we need to protect those vital assets."